Founded by William Hardy at the confluence of rivers and rail lines, Hattiesburg, Mississippi, is today a capital of education, healthcare, commerce and the armed forces in the Gulf South. In this new biography of the Hub City, experience its story as you never have before. Hunt and forage alongside Native American tribes centuries before European settlement. Build a cabin with pioneer lumbermen on the edge of the forest, jostling for profit in the cavernous Piney Woods. Train with soldiers at Camp Shelby on the eve of deployment in World War II, and march alongside civil rights activists during Freedom Summer in 1964. 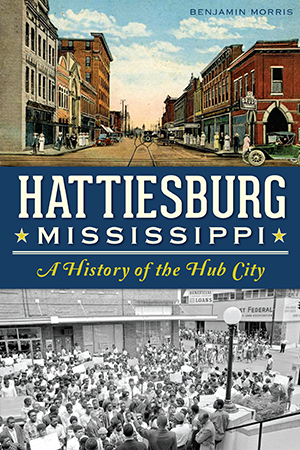 In this narrative history, author and Hattiesburg native Benjamin Morris offers a captivating account of the Hub City from its prehistory to the present day, from its darkest hours to its brightest futures. Mississippi native Benjamin Morris is a poet, fiction writer, playwright and essayist whose work has appeared in the Oxford American, the Edinburgh Review and BBC Radio. A researcher at Open University and member of the Mississippi Artist Roster, he is the author of "Coronary" (Fitzgerald Letterpress, 2011). Among other honors, he has received a Pushcart nomination, fellowships from the Mississippi Arts Commission and Tulane University, and a residency from A Studio in the Woods in New Orleans.